This article was written for Firefox but, in general, it also applies to SeaMonkey. Note: Starting in Firefox 34, localstore.rdf is deprecated and the file xulstore.json is used instead. See bug 559505 and this mozilla.dev.platform topic. Unable to save or download files because the dialog box prompting you to open or save a file does not appear. If you have a backup copy of the localstore.rdf file from a working profile, a quick remedy is to close your Mozilla application and overwrite the localstore.rdf file in the profile folder with your backup copy (see Profile folder - Firefox or Profile folder - SeaMonkey for profile folder locations). If you have no localstore.rdf backup, you will need to close Firefox (or SeaMonkey) and remove the localstore.rdf file from the Firefox (or SeaMonkey) profile folder (by moving, deleting, or renaming the file). When you restart the application, a new localstore.rdf file will be generated. Your toolbar customizations will be gone but future changes will be retained. Before continuing you may wish to save a screenshot of your current toolbar customizations, to help you restore them later. Note: You can restore the default set of toolbar items by opening the Customize Toolbar dialog and selecting "Restore Default Set" but this does not restore the default content of the localstore.rdf file and is not a solution if the localstore.rdf file is indeed corrupt. Use either of the two methods given below, to regenerate the localstore.rdf file. Open the Firefox profile folder (see the linked article for details). Delete (or rename) the file localstore.rdf. Note: In Firefox 15 and above, Safe Mode has been redesigned to replace the individual troubleshooting options that were included in earlier Firefox versions with the option to Reset Firefox. Resetting Firefox will automatically create a new profile which will include a new copy of the localstore.rdf file; however, using the Reset Firefox feature will also remove all of your other Firefox profile data and settings, except for certain essential data (bookmarks, browsing history, passwords, cookies, and form-fill data) that is migrated to the new profile. The old Firefox profile will be deleted and all of the old Firefox data will be moved to a folder on the desktop. Warning! This change cannot be reversed without manually transferring the old Firefox data back to the new profile. Restart in Firefox Safe Mode using the instructions in the Safe Mode article. After restarting in Safe Mode, a window called Firefox Safe Mode will appear. Select the option Reset Firefox and follow the prompts. 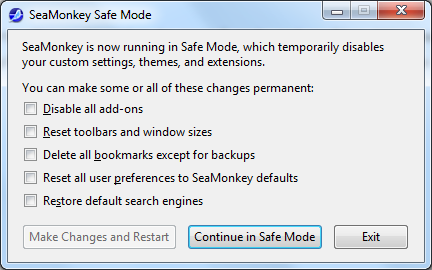 Restart in Firefox Safe Mode or SeaMonkey Safe Mode using the instructions in the Safe Mode article. After restarting in Safe Mode, a window called Firefox Safe Mode or SeaMonkey Safe Mode" will appear. Select the option Reset toolbars and controls (Firefox) or Reset toolbars and window sizes (SeaMonkey). Click "Make Changes and Restart". Bug 559505 - localstore.rdf kills ponies / Deprecate localstore.rdf and replace it with xulstore.